The Social Network Visualizer project is happy to announce that a brand new version of our favorite social network analysis and visualization software application has been released. SocNetV version 2.3, released on Jul 5, has the eloquent codename "fixer" and it is now available for Windows, Mac OS X and Linux from the Downloads page. - The arc reciprocity, which is the fraction of reciprocated ties over all actual ties in the network. - The dyad reciprocity which is the fraction of actor pairs that have reciprocated ties over all pairs of actors that have any connection. In a directed network, the arc reciprocity measures the proportion of directed edges that are bidirectional. If the reciprocity is 1, then the adjacency matrix is structurally symmetric. Likewise, in a directed network, the dyad reciprocity measures the proportion of connected actor dyads that have bidirectional ties between them. In an undirected graph, all edges are reciprocal. Thus the reciprocity of the graph is always 1. 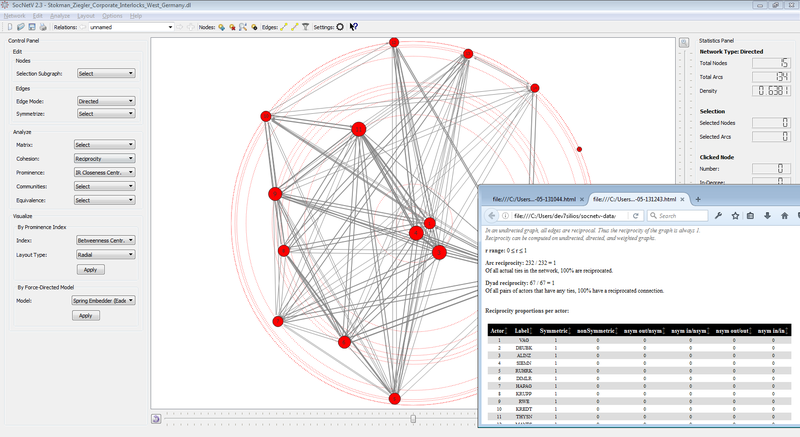 Reciprocity can be computed on undirected, directed, and weighted graphs, from the toolbox/menu: Analyze > Cohesion > Reciprocity. The report is opened and displayed as usual in HTML format in your preferred web browser. Zero-weighted edge support: In ordinary SNA, zero-weighted edges are thought to be meaningless, but a user pointed to us that SocNetV was accepting and drawing zero-valued edges when opening edge list formatted files. Apparently this was due to a bug. In fact, the whole concept of an edge in SNA (and SocNetV) is that two actors i and j are "connected" (and an edge is drawn between them) only if there is a non-zero value at sociomatrix cell A(i,j). Thus, if A(i,j)=0 then the actors are considered not directly connected and no edge should be drawn between them. This assumption has implications in computations as well: all centrality and matrix manipulation algorithms of network analysis are implicitly computing their results using only non-zero (and some of them only positive) weighted edges between actors. Nevertheless, we understand that some users may need this functionality only for visualization reasons. Thus, we implemented this functionality in v2.3. Please note that this functionality will work (for the time being) only for weighted edge lists and only for simple visualizations. 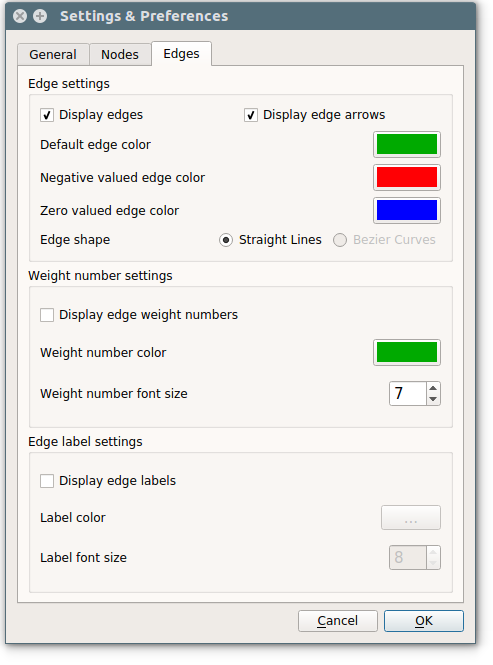 Zero-weighted edge color selection: With regards to the above new feature, the Settings dialog allows the user to select default edge color for zero-valued edges. Here is a screenshot.